Brenna and Henri's love story is one of these meant to be kind of stories. Brenna and Henri met each other in the neighborhood park back when there were kids on a Lower East Side. Brenna then moved to CT to attend middle and high school to later return to NYC to graduate from high school in the city. Brenna started working at a retail store where she met Henri (not realizing they knew each other). They started dating, and realized they knew each other when Henri's parents mentioned knowing Brenna and her family. These two have since been together for over a decade and decided to celebrate their union in a stunning Eolia Mansion at Harkness State Park. I remember arriving at the park and breathing in the fresh smell of the Long Island Sound. It is, no doubt, one of the most breathtaking settings for a wedding in CT I've ever photographed with lush gardens, vast green fields leading to the water and the mansion itself provided such a great space for both the dinner reception and the party. From emotional vows during the ceremony to some serious dancefloor swag Brenna and Henri had a celebration to remember! "We were set up by mutual friends and neither of us were too excited about a blind date. We blew it off for as long as possible until our friends virtually forced us to go. (We are both from Long Island, and both did not want to date anyone else from Long Island. Go figure.) We had a great first date. Jared picked a very stuffy spot on the Upper East Side (because he had just moved back to the city and had no clue where to go) and we drank a couple of $20 Manhattans each before deciding we were more suited for some place a little more casual. The date lasted five hours, and the rest is history. We had an incredible courtship - everything was just so easy. No arguing, no questioning, no game-playing. We hit it off immediately, had so much fun together, and it has been that way ever since. We have more fun with each other than we have with anyone else in the world. We laugh every single day. That's not hyperbole. We literally laugh every single day." 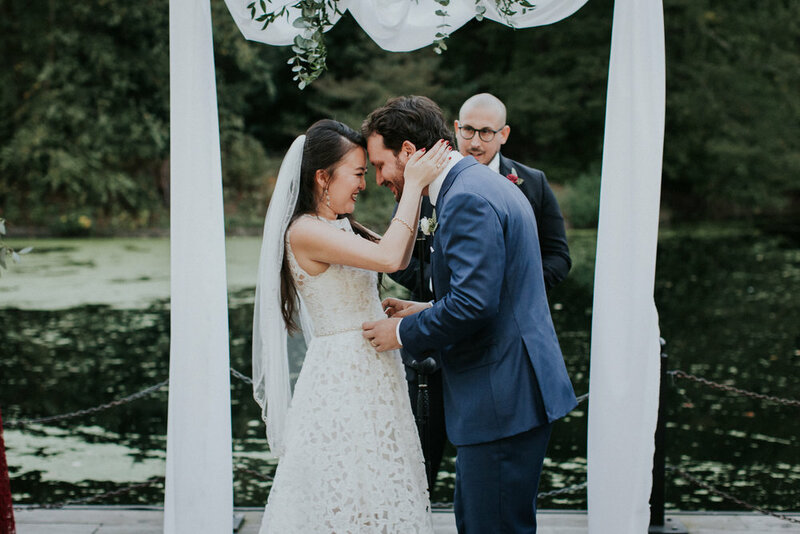 Jennifer and Lino met 12 years ago in Canada and after adventuring together for a decade they decided to tie the knot in one of their favorite places - NYC. Lino surprised Jennifer with a romantic proposal in San Diego but for the ceremony they wanted the iconic New York skyline. 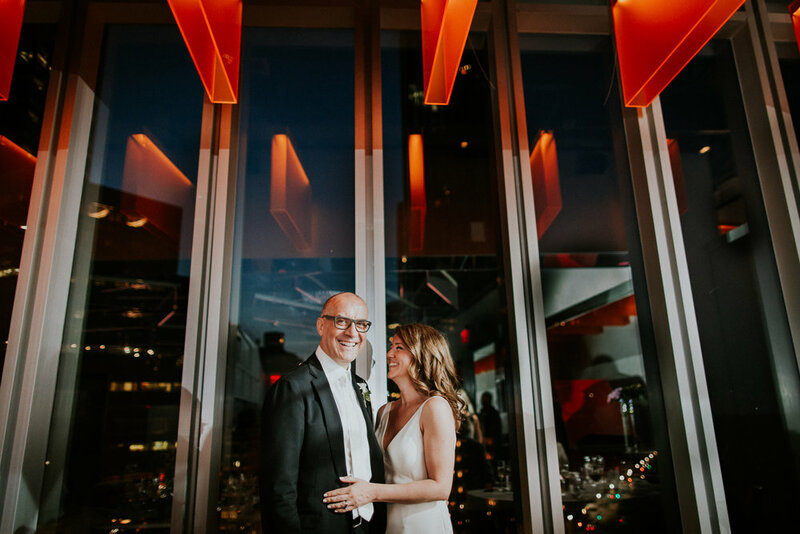 I met the two in one of the coolest AirBnBs in Bushwick and witnessed their emotional first look and then we adventured around Dumbo following their ceremony. Hard to forget the views of Oceanbleu that opened up to me after driving for 3 hours from Brooklyn. Vast Westhampton Beach with it's sandy fields and grass dancing in the wind. Let me tell you Danielle and Vin got some windy weather but hey it makes for some imperfectly perfect images! ;) These two live by the beach on Long Island so naturally having their celebration in a place that reminds them of home and childhood was a no brainer. Taking a stroll on the beach during the sunset was pure magic! Danielle and Vin met a while back so they had a very close knit circle of friends and everyone seemed to know each other. From their ceremony with epic ocean views to the even more epic dance party later on Danielle and Vin's celebration was a blast! As it stands in the wedding photography industry Indian weddings happen to be a niche that some photographers focus on and others dream of shooting because of all the colors and pretty decor. Personally, Indian weddings for me are much more about the action and the moments which fits with my style perfectly. Sometimes these moments are so small and yet so meaningful and that's the beauty of these traditional ceremonies. When Nadiya and Sherief reached out to me I think we instantly vibed! Considering their Indian wedding wasn't so much focused on the formal photos but rather me documenting the events candidly I said yes right away. Below is a beautiful story of colors and traditions but look closely and you'll see that it was all in a celebration of something very special and genuine between Nadiya and Sherief and their families! Hawaii! It's one of these places I had on my bucket list for a while and when the opportunity presented itself and we started thinking about escaping NYC winter somewhere warmer I suggested to finally check out Hawaii. I once was invited to a wedding in Hawaii and I couldn't go because I was booked for another wedding here in the city but the thought of the going there always lingered on my mind. My hubby got his spring break time off from university and instead of the usual Caribbean getaway I was craving something a little more exciting and unique. When we started our search (quite late I should say!) I naturally gravitated towards the Island of Maui. After binge watching travel videos on youtube I was excited to explore the wild adventurous Maui where you can lay on the beach one day and go on a crazy adventure the next. I am happy to say my expectations were exceeded and can definitely recommend Maui for anyone in the mood to explore a unique place on Earth. "We first met on a snowy February afternoon in 2012 at a cozy Italian restaurant in West Harlem owned by Massimiliano’s good friend, Sandro. My friend Alex suggested we go for a late lunch telling me the pizza was really good. She also told me that Sandro always had friends from Italy hanging out there and that we would no doubt be entertained. Within 5 minutes of being seated, Sandro brought Massimiliano over to our table and introduced him. We chatted for a bit then they left us alone to eat. During dessert, Massimiliano came back to the table to chat/flirt a bit more and Alex whispered to me that she was sure this would end with him asking for my number - which he did! We went out the following week but it was not a love connection and ...he disappeared...for awhile. He reappeared that summer via text and continued to text me once every few weeks over the next 16 months which I always ignored. At the end of September 2013, I found myself back at Sandro’s restaurant for dinner with friends and we were talking about the first time I came to Sandro’s. On a whim, I texted Massimiliano (finally) to ask if he was going to be at the restaurant tonight and he responded almost immediately that he was driving home from work and he would be there as soon as he could. What I didn’t know at the time I texted, was that Sandro had already texted Massimiliano earlier to let him know I was at the restaurant and he should come by. Massimiliano ’s response to Sandro was that I had ignored his texts for 16 months and he was tired and going home. He showed up 40 minutes later to Sandro’s surprise. He joined us for dinner that night and we’ve been together ever since! "We met seven years ago on a Saturday night in a bar on the lower east side called Pianos. Dzavid was with a group of guys and Erica was with two of her girlfriends when the groups bumped into each other. Dzavid and his friends played a little joke on Erica and her friends by pretending to be cousins, which was quite confusing because they all look nothing alike. Erica and Dzavid ended up chatting, laughing and dancing the entire night and exchanging phone numbers. Dzavid later admitted that he and the guys were not, in fact cousins, but friends from Bronx Science High School. Dzavid called Erica that week and they went out on their first real date in the East Village which started with drinks and ended with a slice of pizza (our absolute favorite food!). It's been true love ever since. " Fast forward to their wedding day and we, of course, had to get some pizza and Dzavid also decided to play a little game of basketball with Erica in West Village. The celebration continued at the beautiful private room in Casa Apicii. Maryann and Ben met in NYC but decided to celebrate closer to Ben's home in Maine! Gorgeous location, sweetest people and tons of fun captured in this set. I love when weddings feel like an adventure and Maryann and Ben's day certainly felt like one! "Sarah and Mark met on the deck of a sinking destroyer and, soon after, realized that they should get to life rafts. They were separated amid the commotion of the rescue. Mark meant to call Sarah afterward but accidentally blew his nose with the slip of paper containing her number. He also dropped it into the Atlantic after he was spooked by what he thought at the time was a narwhal (it was actually a unicorn swimming)." It's time I share some Brooklyn love with you! Hayley and Ryan met at work 5 years ago and became friends right away but didn't start dating until a year later after one fateful canceled date Ryan instead invited Hayley to a concert where "a spark" finally happened! I met these two in a their neighborhood Brooklyn coffee shop and they seemed so into each other I knew their day would be fun and full of laughter. Hayley and Ryan told me they are the biggest goofballs who love to laugh more than anything, go on adventures, hang out with their two pups and looking to help out the world! It was a pleasure getting to know these two amazing people and capturing their beautiful stylish Brooklyn celebration!